To determine the effects of left gastric artery embolization (LGAE) on computed tomography (CT) body composition change. 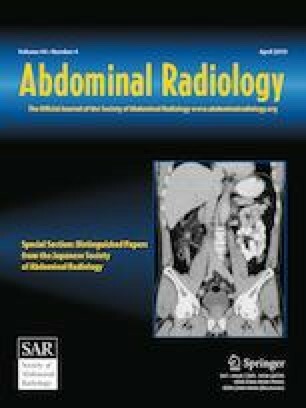 Sixteen overweight or obese patients who had abdominal CT scans before and after LGAE for gastric bleeding were retrospectively reviewed. Body composition analysis was performed with semiautomated imaging processing algorithms (MATLAB 13.0, Math Works, MA). Adipose tissue and lean skeletal muscle were measured using threshold attenuation values. Total body fat index (BFI), subcutaneous fat index (SFI), visceral fat index (VFI), intramuscular fat index (IMFI), and skeletal muscle index (SMI) were determined ([tissue area (cm)]2/[height (m)]2). Excess body weight (EBW) was determined based on the Lorentz formula for ideal body weight. Mean follow-up was 1.5 ± 0.8 months. Following LGAE, patients experienced significantly decreased body weight (p = 0.003), BMI (p = 0.005), EBW (p = 0.003), BFI (p = 0.03), SFI (p = 0.03), and SMI (p < 0.001). Changes in VFI and IMFI did not significantly change (p = 0.13 and p = 0.83, respectively). Patients who underwent LGAE had significant unintended weight loss as a result of decreased body fat and skeletal muscle. Body composition analysis can readily assess the extent of fat loss and identify muscle wasting. Sanjay Misra receives funding from National Institutes of Health Grant HL098967 from the National Heart, Lung, and Blood Institute and DK107870 from the National Institute of Diabetes and Digestive and Kidney Diseases.